SSB Assistant Commandant Syllabus: Sashastra Seema Bal has released 154 vacancies to fill the Assistant Commandant post for the year 2019. So, aspirants have to check SSB Assistant Commandant Syllabus and SSB Assistant Commandant Exam Pattern for their preparation in this page. Contenders can also download SSB Assistant Commandant Syllabus and Exam Pattern by going through this article completely. Furthermore, if candidates want to know more about SSB Assistant commandant Examination they can visit our site for the detailed information. Therefore, the complete details of SSB Assistant Commandant Recruitment 2019 have been provided in the above table. So, the candidates who want to work in any of the Central Armed Police Forces (CAPF’s) can fill the online application before the last date. This SSB Assistant Commandant Recruitment 2019 is only for those individuals who are serving as Sub-Inspectors/GD and Inspectors (GD). The expected salary for Assistant Commandant is Rs.56,100/- (PB-III of Pre-revised scale Rs.15,600-39,100 + GP Rs.5,400/-) plus all allowances. Directorate General, Sashastra Seema Bal has invited online applications from all Sub-Inspectors/GD and Inspectors (GD) for the post of Assistant Commandant (GD) in the Sashastra Seema Bal, Central Reserve Police Force, Border Security Force and Indo-Tibetan Border Police. There are overall 154 Vacancies. The recruitment for these Assistant Commandant Vacancies will be done through Limited Departmental Competitive Examination (LDCE) as per Recruitment rules of respective forces. Therefore, the interested and eligible aspirants can apply for this SSB Assistant Commandant Recruitment 2019 on or before the last date. Download SSB Assistant Commandant Syllabus & SSB Assistant Commandant Exam Pattern from below for the SSB Assistant Commandant Written Exam Preparation. We have also enclosed the link for SSB Assistant Commandant Previous Question Papers on this page. Therefore, click on the PDF link given below and download Sashastra Seema Bal Assistant Commandant Previous Year Papers PDF. Hence, work hard and prepare well for the SSB Assistant Commandant Online test and grab the chance to work in the Central Armed Reserve Forces. Visit our Recruitment Hunt website daily to know the latest updates regarding all India Govt Jobs Notifications, Syllabus, Previous Year Question Papers, etc. Are you fed up of searching for SSB Assistant Commandant Syllabus 2097? Then, you are in the correct place. 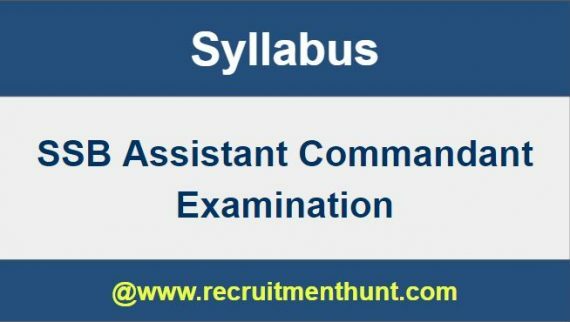 Here, you can get SSB Assistant Commandant Syllabus along with the SSB Assistant Commandant Exam Pattern 2019. Therefore, you can download SSB Assistant Commandant Exam Syllabus & SSB Assistant Commandant Exam Pattern from the below sections. Before beginning the preparation, refer all the topics mentioned in the SSB Assistant Commandant Syllabus and know the concepts in which are weak. Now, make a preparation schedule in such a way that, you allow more amount of time for the topics in which you are poor and prepare well & overcome all your drawbacks. The SSB Assistant Commandant Written Test consists of three papers – Paper I, Paper II, and Paper III. Paper 1 and Paper 2 are of objective type consisting of 100 questions each for 100 marks. Paper 3 is of descriptive type, where the participants have to write an essay, precise, and comprehension. In the above table, we have provided the test pattern and marks weightage for the Interview & Personality Test. The complete and detailed SSB Assistant Commandant Syllabus is as follows. Finally, candidates can download SSB Assistant Commandant Syllabus here. So, applicants can make their preparation easier by following SSB Assistant Commandant Syllabus. Download SSB Assistant Commandant Exam Pattern along with SSB Assistant Commandant Recruitment Notifications on this article. Also, for more Job Updates stay tuned to our site Recruitment Hunt.